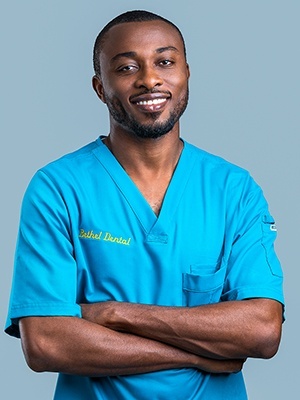 Dr. Gabriel is currently a member of the Ghana College of Physicians and Surgeons, the Ghana Dental Association, and the Ghana Medical Association. He is definitely a tech man! When he isn’t looking in somebody’s mouth, he is surfing the net and looking for the latest technologies. He likes to travel and work with youth organizations in his free time. He speaks Ewe and English. His wife Gifty is a lecturer at the University of Professional Studies in Accra. They live in the city too with their lovely son Dzidula.